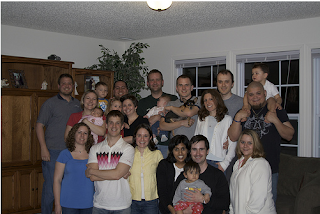 This weekend we had a big reunion in Indianapolis with the Dunlap clan. Of course, not everybody could make it, but for those of us who were able to go, it was really great to see each other. All the childless people were staying at Derek’s, which on Friday night, ended up just being Rob and me. Derek had gone all out. You should have seen how many boxes of pancake mix and cartons of eggs he had gotten. We stayed up way too late on Friday night reminiscing and playing with Ravage—an 8 pound Chihuahua and mini-pincher (spelling?) mix. Of all the dogs in the world, Ravage is probably the only one I truly love. Since the last time I saw Ravage, Derek taught him a few more tricks: one was called “Type my Dissertation” and the other was “Scratch my Back”—both of which are really great tricks. All weekend long, Ravage stayed close to Rob and whenever Rob was sitting, Ravage would curl up in his lap. I was a little bit jealous, but Derek explained that Ravage seeks warmth, and since Rob tends to radiate heat, we figured that explained Ravage’s obsession. On Saturday everyone met at Chuck E. Cheese’s for lunch. Yes, Chuck E. Cheese’s. I’m not sure if this was the idea of the kids or of the parents. Since I don’t like pizza or screaming children, it certainly wasn’t my idea. But I do love ski-ball (and they had a fairly decent salad bar), so it was a win-win situation. Then we all went to hang out at Amy’s afterwards. This was probably my favorite part of the whole weekend. These are the people I have known so long that they are family rather than friends. It was a little overwhelming to me to see us all grown up and many with kids of their own. I still see us as we were decades ago. The first day of 4th grade, when Amy and I became friends out on the playground at recess. In Chuck’s pool at a New Year’s or Halloween party, singing “On Moonlight Bay” with David. Sitting around the lunch table, building towers with Snapple cans. School dances, football games, Detweiller Park, the Maid-Rite, the Dollar Theatre. All the stuff of Dunlap Love. Rob and I left on Saturday night to come home. Since I’ve committed to the marathon, I had to do a 20-mile run this weekend, so I did it today. It certainly wasn’t the best 20 miles I’ve ever run, but at least I put in the miles. And what is it they say? A bad dress rehearsal means a great performance? Well, I’ve still got 1 more 20-miler to go before I’ll consider myself ready for this marathon, so I’ll keep my fingers crossed that that one goes better. I think I may be a bit overtrained; I did run over 45 miles this week, which is probably the most I’ve ever run in any week of my life. All the concrete in this city is certainly taking its toll on my knees and other joints. Long before the end of today’s run, I was wincing with every step. I guess I’d better go put some ice on; one good thing is the weather has finally gotten warm, so it feels like heaven to be outside. Thanks to all for your hospitality and friendliness in Indianapolis this weekend. We ought to do it again soon; it was just so good to see everybody. I wish I could offer my place, but unfortunately, there wouldn’t be a whole lot of room for everybody to stay. I’m wondering if we could plan some kind of camping trip for this summer? Maybe there’s some of centralized location where we could camp out? Think about it: that would be hella fun. Alright, I’ve got to go put ice on my knees. Thanks for reading. I love the pictures. I agree that the weekend was amazing. We need to do it more often! Good luck with the marathon coming up. I am in awe of your running prowess! It's the best you could have hoped for. PS if you do not like pizza and screaming children you may want to avoid the new Jupiters. Nothing like 'old' frinds to make you feel young again. I'm with you, whenever you are with friends that you were in school with, you go right back to being that age. (That is, until you look at the balding heads and a few more lines in the faces, etc.) Sounds like it was fun! Should have previewed my spelling????? ?